EAST HANOVER, NJ--(Marketwired - December 08, 2016) - Elaine Katz, MS, CCC-SLP, senior VP of grants and communications at Kessler Foundation, was honored to receive the Jackson Drysdale Civilian of the Year Award at the GI Go Fund's Annual Veterans Day Gala. This inaugural award memorializes the late son of Diana Drysdale, president of PSEG Power Ventures and PSEG Solar Source. The award, a bronze sculpture of a soldier holding the American flag, was presented by Jack Fanous, executive director and co-founder of the GI Go Fund and Diana Drysdale. Katz was an early supporter of the GI Go Fund's efforts to help veterans with disabilities transition to jobs. Under her leadership, a $30,000 community employment grant from Kessler Foundation funded a home-based employment project -- the Disabled Veterans to Work Program -- which resulted in the hiring of 50 veterans with disabilities working from home in customer service positions. "Thirty of these veterans were working for PSEG when Hurricane Sandy hit," Katz recalled. "While other workers were unable to get to work, the veterans working from home were among the few who were able to handle emergency calls around the clock until power was restored." Fanous credits the Foundation for the success of the Disabled Veterans to Work Program, which has expanded to other cities, where Fortune 500 companies are adopting U.S.-based call centers staffed by veterans with disabilities. 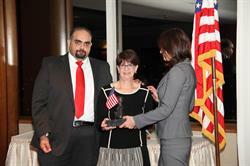 "Elaine Katz is a fitting recipient of our first Drysdale Civilian of the Year Award," Fanous explained. "As a young boy, Jackson Drysdale showed an uncommon interest in helping our veterans. His dedication spurred PSEG to support our efforts to identify veterans in need and connect them with securing housing, benefits, legal services, and employment. The successful partnership of the GI Go Fund and PSEG is due to the uncommon dedication of Katz and her team to find solutions to the employment needs of people with disabilities." GI Go Fund is a 501(c)(3) nonprofit charitable organization that provides assistance to all military veterans by helping them find employment, access housing, and secure their educational and health benefits. Having partnered with great corporate leaders like PSEG and Panasonic, as well as innovative employment services like JobPath, to help veterans train, connect to mentors, and find work, the group has helped thousands of veterans across the country and is paving the way for the next generation of veterans to get back on their feet. Elaine Katz (center) accepts the Jackson Drysdale Civilian of the Year Award from Jack Fanous and Diana Drysdale at the GI Go Fund's Annual Veterans Day Gala.